How Strict Are Publisher's Guidelines on Manuscript Length? How Firm are Book Publisher’s Guidelines on Picture Book Length? I had a question come up last week: how hard and fast are the rules about the length of a picture book manuscript? Can you get by with 1900 words? 2000 words? 2500 words? The length requirements for every genre, from picture books to easy readers to short chapter to middle grade and teen novels — the recommended lengths are only guidelines. Write your story the best way you can. Most editors will say to write the story you need to write. They will worry about how to fit it all into 32 pages, or if it should go to 48 pages or if it should be cut. Some genres, some publishers are very strict on guidelines. On the other hand, some publishers and some genres have very strict guidelines. Easy readers are only allowed a certain number of characters per line and rarely exceed posted story length. If in doubt, ask the editor; or, simply follow the guidelines. Consider your audience. You should also consider your readers and the characteristics and interests of the readers. For pre-school kids, do you really expect them to sit still and stay interested in something that is 2000 words long? Time yourself reading those 2000 words and consider the attention span of young children. Given a choice, wouldn’t they rather hear a story — complete with a beginning, middle, end and an emotional tug — in just 200 words? Make sure you are matching up a story with an audience. If you are breaking the guidelines, ask yourself the tough question: is this story targeted to the right age audience? Don’t fall in love with your words. Also, be sure — how to put this delicately — make sure you aren’t being lazy or sloppy in your writing. I’ve seen 2000 words stories that can easily be cut to 800 words and be all the better for it. I’ve had stories like that myself. Change as many verbs as possible to active verbs, eliminate all adverbs, and most adjectives; convert prepositional phrases to adjectives or omit; cut any redundancies; cut dialogue to bare minimum; etc. Cut. Follow the guidelines — usually. In other words, the guidelines are guidelines for good reasons and if you ignore them, it is at your own peril. Yes, of course, you’ll find picture books at 1900 words; but they will be written for the upper elementary students, not the toddlers. But there will also be rare exceptions when the subject matter, the writing, or the genre will allow you to bend the guidelines — a little. Great! 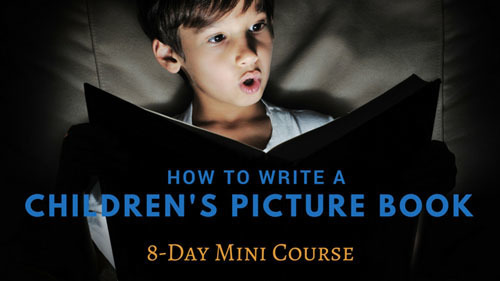 Now check your email to confirm your subscription, and we'll get the free mini-course started, How to Write a Children's Picture Book.